The crown chakra is located few inches above the head, the color associated with it is violet, and is the most important energy center. The crown chakra is the door to source, or the higher mind, and is the true path to spirituality. When this chakra is balanced, one have an infinite supply of energy pouring into the energy body, clearing away all blockages, and continuously developing, and strengthening the other chakras, and meridians. The crown chakra is the heart of the soul; that is exactly why a famous meditation like the twin hearts exist. This meditation identifies the crown chakra as another bigger, and more powerful heart chakra within the energy system. When this chakra is weak or closed we lose our connection to source, we live thinking that we are separate from everything around us, and all spiritual practices become absent from our lives. Skeptics are a very good example for a closed crown chakra, they tend to use their analytical mind, and they calculate risks all the time simply because they do not acknowledge the existence of their higher mind. 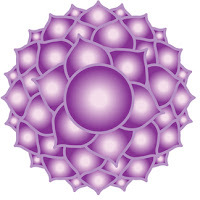 The crown chakra is recognized in most meditation techniques as the source of white light, or cosmic energy, and protection. It is not uncommon to find a meditation starting by visualizing a white light or a stream of energy pouring into the crown, and that is exactly why this chakra is very important. sit comfortably, and make sure not to be disturbed for at least ten minutes. Start breathing slowly, and deeply. Feel your body parts relax as you breathe, let your feet relax, let your legs, your hips, and torso relax. Let this wave of relaxation move up your spinal cord relaxing all muscle groups in your back, feel the relaxation wave move your abdomen area, and then slowly going up your chest relaxing all muscles, and organs in that area. Allow the wave of relaxation to slowly move to your shoulders, neck, and head, then feel it on your face, let it relax all muscles on your face, feel this wave of relaxation taking over your whole body until you are completely relaxed. Once relaxed, visualize a lotus flower right above your head, and feel the petals of the lotus slowly opening. When the lotus is open, imagine a stream of pure white light pouring inside the lotus flower, and going down inside you through your head. Notice how beautiful it feels as the light moves through your body until it leaves to the ground through your feet. Continue to feel this loving energy pouring inside your head, and feel the oneness with source, affirm that you are one with God, and that God is now within you. Continue to say the affirmation until you feel this amazing energy taking over your mind. Thank God, thank the infinite energy that now runs through you, and end your meditation. The below meditation is one of the most beautiful that i have personally tried. Give it a try if you find it hard to meditate on your own. All types of spiritual practices maintain a healthy a crown chakra, be it prayers, chants, meditation, tai chi, etc.. All spiritual leaders are known to have a very expanded crown chakra. Daily prayer, and meditation will help expand, and strengthen the crown chakra. The practice of gratitude on daily basis is another powerful tool to heal the crown chakra. Gratitude is a very powerful mental connection between the higher mind, and the physical mind. However, in order to maximize the power of gratitude one must learn to be grateful even during times of suffering by understanding that this suffering is nothing but a release of past events, it is only a step forward towards spiritual growth. Essential oils like cedarwood, elemi, galbanum, gurjum, rosewood, sandalwood, and vetiver are known to help balance and open the crown chakra, especially when used during meditation. For more information on how to use essential oils please check how to use essential oils effectively. Unlike all other chakras, fasting, breathing, and detoxing are essential to maintain a strong crown chakra, it is known that the crown chakra opens, and receives streams of energy as one fasts. The crown chakra is called the hissing snake, when this chakra is active you will be able to notice a hissing sound in both ears; Also, it is very common to feel energy pressure around the head, or energy spinning right above the head, those symptoms are reported by many, and i experienced them myself.